Indian names: phlankur (Himachal Pradesh); chappar tang, bara churcheri (Kumaon). 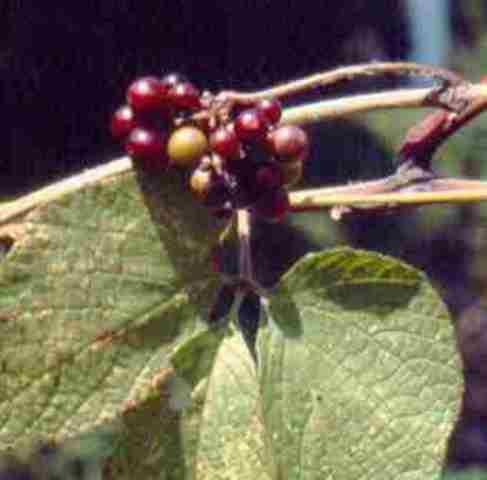 Bhambti is a commonly found climbing shrub in the forests ranging in altitude between 500 and 1,500 metres. One of the important characteristics of these grapes is that they ripen very late, i.e. in October. The common grapes ripen in this region in July. Second unusual feature of this plant the tuberous roots. The tubers attain almost the size of a large bottle gourd. These tubers are cut into small pieces and fed to milch cattle. They are said to have a cooling effect on the animals. A deciduous vine, climbing on other trees in the forest by means of bifurcated stem tendrils; height varying from 5 to 8 metres; tendrils, borne opposite to the leaves and also at the base of inflorescences; internodal length, 10.2 to 16.5 cm. Leaves serrated, long-stalked having 8.5 cm long pedicel, trifoliate palmate; terminal leaflet, 8.5 cm long, 4.1 cm broad; lateral leaflets, 7.9 cm long, 4.8 cm broad; newly formed leaves, simple, having reticulate venation and acuminate margin. Flowers, bisexual, regular, green, pedicellate to nearly sessile; inflorescence, compound umbel, containing 73 to 205 flowers per cluster; calyx, small, lobed, green; corolla, with 4 to 5 petals, a light red to green, actinomorphic; androecium, polyandrous, stamens having a short filament, circular yellow anther lobes; gynoecium, single-styled, small, having a terminal stigma. Seeds, 4 to 5 mm long, 2 to 3 mm broad; weight, 243 mg; volume, 265 microlitres; 2 to 4 seeds per berry. Flowering starts from the first week of August and continues up to the end of August. The fruiting season starts from the middle of October and continues up to the middle of November. It is not a heavy-yielding grape and the average yield is about 750 g per vine. These fruits contain 49.8 per cent extractable juice. The moisture content of the fruit is 75.7 per cent. The total soluble solids and acidity in the fruit juice are 18 and 1.27 per cent respectively. The juice contains 8.60 per cent total sugars, 6.69 per cent reducing sugars and 1.82 per cent non reducing sugars. The vitamin C content of the fruit is good, being 12.19 mg per 100 ml of juice. The total mineral content of the fruit, as represented by its ash, is 1.437 per cent. The protein content of the fruit is 2.86 per cent. The content of some of the important mineral elements of the fruit, viz. phosphorus, potassium, calcium, magnesium and iron is 0.071, 0.413, 0.122, 0.099 and 0.007 per cent respectively. The fruits are juicy and sweet to acidic. The overall fruit quality is fair. The fruits are edible. They are sweet and are liked by all. Birds cause heavy damage to these fruits during the fruiting season. One of the important characteristics of this species is its very late fruit-ripening. Use should be made of this character in hybridization for evolving varieties which might ripen after the monsoon. Root tubers of this wild grape are chopped to pieces and fed to to cattle. Local people believe that these have a cooling effect on cattle. 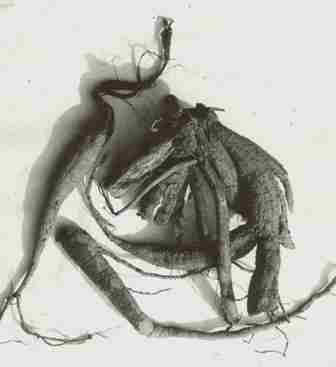 However the nutritive as well as the medicinal value of the tuber roots of this species should also be studied. Grape cultivation is not very successful in Himachal Pradesh because of heavy rains at the time of fruit-ripening, as the fruits are damaged by rain. If some late-ripening variety is evolved by crossing the vinifera grapes with this species, it would be a great boon to the orchardists of this region.